Below is what I'm trying to achieve. I've drilled a hole into the indicator lamp plastic moulding and inserted a 20 Watt halogen bulb, connected temporarily to the battery to show how it looks. It's actually quite a lot brighter than the photograph shows and it's clearly visible in daylight from the front and side but without obscuring the orange indicator bulb when it's flashing. Below you can see the hole that I drilled from inside the engine compartment. 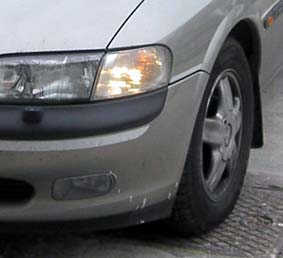 OK, I know that some people don't like "Volvo" style daytime lights. That's not my concern and I won't enter into any discussion about it so please don't even bother to write. If you have any feelings against it, write to the Institute of Advanced Motorists or your local MP or somebody to get it off your chest. Don't bother preaching to me. Thanks. So what's the technical problem? I knew it would be a problem before I even started. The heat from the bulb melts the plastic. 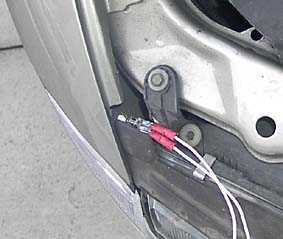 By the way, the wires are PTFE insulated and attached to the bulb pins with crimp connectors suitably modified. I plan to strip off the red insulation and substitute silicone rubber if this project ever continues. So the main problem is the VERY hot bulb. The limited space inside the indicator housing means that the heat has nowhere to go so if I were daft enough to leave the bulb powered for more than a few minutes, the front of the housing would melt and sag. Even after 30 seconds the plastic around the hole is smoking. I plan to reduce the voltage to the bulbs - probably by connecting the two in series. They should still be bright enough but they HAVE to run hot in order to maintain the correct tungsten atom migration pattern (so the tungsten filament doesn't get eroded). I thought maybe I could use some sort of light pipe. A short piece of glass rod with one end ground to a dome shape and left "frosted". 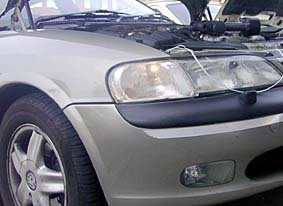 I thought of fitting a "dim-dip" unit to the dipped headlamp bulbs instead. But the light would be more diffused and not as visible to the sides. 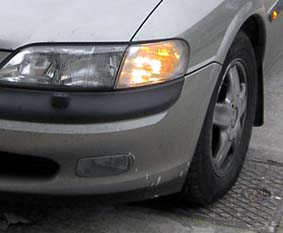 Likewise the main beam bulbs. I've also thought about putting white bulbs in the indicators and using those. 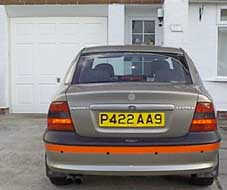 Then I'd have to find some way of adding flashing orange indicators. Maybe the halogen ones could be the idicators - that would reduce the heat problem. Any "bright" ideas about how I might achieve this project. I thought of LEDs but it would take a lot! Here's the glass rod that I tried with one end ground to a dome shape. It *would* work except I need a reflector to direct the light into the end of the rod - and there really isn't room for a halogen bulb with a reflector. So my next idea is to cut a hole in the bottom of the lamp moulding and fit a 10 Watt halogen bulb in it with a proper ceramic holder. There might just be enough air volume for the heat to dissipate without melting the plastic. I did, at one point, have the daft idea of fitting a small fan to extract the hot air. Unfortunately, that would drag in dust so the nice shiny reflector wouldn't stay bright for long! Above is what I settled for. 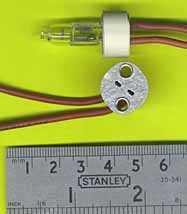 A 20 Watt halogen bulb in a ceramic holder was fixed in a hole cut in the underside of the indicator unit. Below you can see the indicator flashing. It's pretty obvious so there's no confusion! 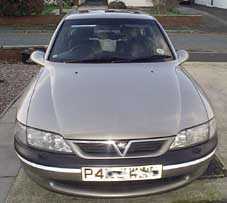 The wiring was arranged so the lights come on with the ignition switch but go off when the sidelights are on. They are fed via a relay from a fuse off the battery. The relay coil gets its ground through the sidelights and its live from an ignition-controlled wire in the front relay box.